Incredibly tender, delicious and wonderfully smelling gigot/leg of lamb, a true and zesty pleasure for our band. 1 nicely sized, lean 2,5 kg leg of lamb Have the bone removed to fit leg of lamb into a cast iron pot (casserole dish). 8 large cloves of garlic Peel garlic cloves, remove seed. Using a sharp, pointy knife make small incisions to meat and insert garlic cloves. 3 fresh, washed Thyme twigs At the bone sections separate meat from bone and place Thyme. 30 ml olive oil Using a freezer bag insert leg of lamb together with 2 twigs of Rosemary, salt, ground pepper and olive oil, close and mix ingredients. allow to sit for 1 night in fridge Put into fridge overnight. shot of olive oil Using a pan and olive oil roast leg of lamb from all sides. When nicely roasted place leg of lamb together with Rosemary twigs into casserole dish. 30 cloves of garlic Peel garlic cloves, remove seeds and place around meat. 4 Thyme twigs Wash Thyme, put into enclosed mesh and place next to meat. 50 cl Monbazillac wine Heat the wine for 5 min to evaporate alcohol, then pour into casserole dish. salt, freshly ground (pepper mill) mixed pepper Sprinkle with salt and pepper. Set aside. 1 pinch of salt Prepare dough to seal cover. Mix flour, salt, and egg, using your hands knead into homogeneous dough. Then forge a roll fitting the circumference of casserole. Place on edge and put cover on top to seal casserole. 120°C / 10 hrs Upon reaching temperature place casserole (cast iron pot) into oven. 150°C / 2 hrs After 10 hrs raise temperature to 150 °C. 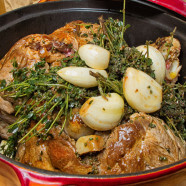 Serve and arrange gigot with garlic cloves on a platter, remove mesh with Thyme. Cover with aluminum foil. If necessary reduce sauce, filter and pour over meat. Serve leg of lamb together with Thyme, Laurel Potatoes and candied cherry-tomatoes.